DTM Black Cavendish Danish Style. Last edited by jimbo44; 03-01-2019 at 10:21. SG FVF/BBF Mix in an Orlik Pot. March already eh? Always liked to see the arrival of March back in Scotland as it meant warmer weather and longer days ahead.....here I see it as being the end of the hot weather. Having said that they say it'll get up to 34c today. For my first smoke of the day I dad the choice of two unfinished bowls this morning...twist and Amphora Virginia. I went for the latter. Capstan Blue in a Barling. Good Morning, Gentlemen, and Welcome to March! It's 26°F/-3.3°C with sunshine here in our town. Yesterday my caring wife decided to postpone going food shopping and that left me no choice but to goof off. Today we'll have to go and also make a stop at the pet supply store to get more food for the feline family members. They've been fed and Grover is out on yard patrol, but I'll give him a call shortly to see if he's ready to go back inside. Today marks the beginning of my fifth year being a member of PSU. I'd like to thank everyone for the entertainment, education, information, gifts, and friendship! 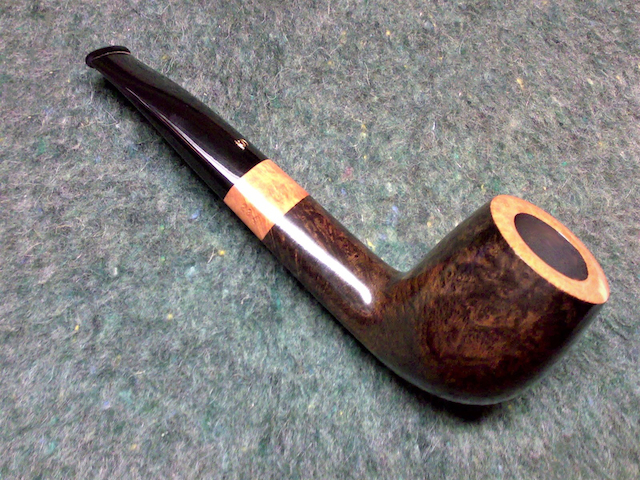 Now smoking a bowl of Limerick VA flake in a Sav "Venere 128" with a mug of good coffee tucked under my jacket. Just settled down in the shed for the rest of the grey and at times drizzly day that starts March around here. I went to the optician this morning and ordered new glasses. It turned out that for long distances my eyes haven't changed, but for short distances like reading, I need something new. My first plan was to just get reading glasses, but while teaching my classes, for example, I would then have to change several times each minute to switch between reading some text and talking to the students. So I have decided to go for varifocals (had to look that word up In the dictionary). For long reading sessions such as here in the shed I am getting simple reading glasses just for short distances. I've taken a bit of Peter Heinrichs No 110 aka Orlik Dark Strong Kentucky and added a bit of PH Chateau Henri No 51, the Latakia blend. This is now my first smoke in the shed in a Peterson 313 System. Markus! Varifocals take a bit of time to get used to them, 1st time I got my ones I took a right dizzy spell with them and felt sick, but now wouldn't be without them, just take care the first couple of days. A sunny 24c now with a heck of a warm wind blowing which explains why they say it'll be 34c later....can't see it going as high as that though. Finishing the bowl of twist I had lying around before I have my lunch.....might just have a glass of cold beer along with it.